Pictures of Mount Vesuvius. Images & photos of the volcano which erupted in AD79 destroying Pompeii in the Bay of Naples Italy. Since March 1944 Vesuvius has been dormant but in AD79 it erupted with ferocity spewing molten rock and pulverised pumice at the rate of 1.5 million tons per second, releasing a hundred thousand times the thermal energy of the Hiroshima bombing. By the time the eruption of Vesuvius was over an estimated 16,000 Romans had been killed and Pompeii had disappeared under several meters of volcanic ash. 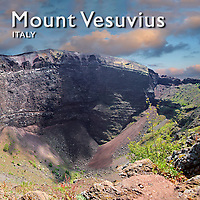 Vesuvius was formed by the collision of the African & Eurasian tectonic plates. As the African plate was subjected under the Eurasian plate, water saturated magna was pushed into the hot depths of the earths crust. As the water boiled to produce high pressure steam it was forced up through the moulted magma eventually finding a weak spot in the earths crust producing a volcano. Vesuvius is the most famous of a several volcanoes around the bay of Naples and its notable eruptions include one in 472 and 1631 from which Vesuvian ash fell on Constantinople 1,200 Kilometres (750miles) away. In recent years it has remained dormant, the last eruption being in 1944 destroying around 80 B-52 bombers at a nearby US air base. Today 600,000 people live near Mount Vesuvius and a sophisticated system has been put in place to monitor the volcanic activity to give enough warning to evacuate the inhabitants of the Bay of Naples. To help limit the population next to Vesuvius a National Park was created which along with Pompeii have UNESCO World Heritage Status.